Abbott Septic Service is your best choice for septic tank pumping and cleaning in San Diego County. 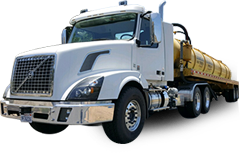 As one of the oldest septic tank companies in the local area, our experience in septic tank services is incomparable. All of our services are provided by septic system experts. They have an average of 20 years of experience, and many of them are PSAI and NAWT certified. Over the last seven decades, Abbott Septic has pumped nearly 50,000 septic tanks for thousands of satisfied clients. With our extensive experience, you can count on Abbott for superior service. As further testament to our honesty, skill, high-quality workmanship, and fair rates, we consistently receive between 60 and 70% of our business from returning clients and referrals. With Abbott, you always get what you pay for. As part of our standard septic tank pumping service, we empty the entire contents of the tank, including all liquids and sludge, according to the highest of industry standards. Additionally, we clean out the effluent filter when accessible and check for any obvious signs of trouble that could lead to bigger problems or failure in the future. For example, if the bacteria in a tank have become inactive, we'll first try to determine what's killing off the bacteria, such as bleach, water softener salts, or pharmaceuticals. If we can eliminate the cause, we can pump out the tank and then supply replacement enzymes; if not, our technician will recommend more-frequent pumping visits. We can also inspect the system and determine the cause or extent of an issue. If we find the issue is with your septic system, we'll complete the repairs and let you know if there are signs of a structural defect. Every system is different, which is why having an experienced septic tank professional is so important. Call Abbott Septic today to schedule septic tank pumping in San Diego County. In most cases, septic tank pumping is recommended every three years, but we can also use a formula based upon your system and usage to provide a more accurate pumping period recommendation. For easily accessible and exposed septic tanks, we offer same-day or next-day service. We also offer electronic tank location services. Location and dig-out service requests can typically be accommodated in about 7-10 days. 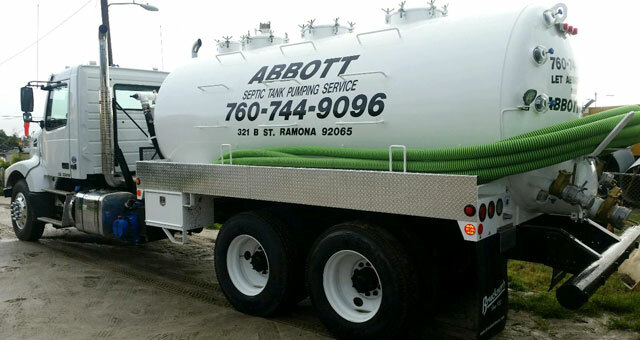 Abbott Septic is fully licensed and insured, and also a member of the San Diego County Sewage Haulers Association.